There’s no shortage of fast food chains offering king sized burgers throughout the US. But when it comes to tiny hamburgers or sliders, there are really only two names battling it out: White Castle in the North and Krystal in the South. The battle lines have been clearly drawn, with some preferring one over the other. But really, which one is better? First things first, the prices should be compared. Buying four White Castle burgers cost around $3.20 or about 80 cents per burger. Now if you buy the same number of Krystal burgers it will cost you about 91 cents each. That’s not much of a price difference, and depending on where you buy the prices may differ by a few cents. You also have to consider the fact that while both burgers have pickles, cheese and onion, Krystal does have mustard, something White Castle doesn’t offer. That’s what you get for the extra 11 cents. So while White Castle is cheaper, Krystal wins the toppings comparison. Sizes of both burgers are similar. As far as aroma is concerned, the burgers at Krystal restaurant have a slightly stronger scent. The real deal though comes with the taste. Digging into a White Castle burger and you immediately get a taste of something juicy and sweet. Krystal burgers are juicy too but they don’t have the sweet flavor. This might have something to do with the way White Castle burgers are prepared. Or this could be due to the mustard in Krystal burgers that produces such a tangy taste. Who knows? The cheese in both burgers is practically the same and so is the beef texture. Their onions are also indistinguishable as are the pickles. But the biggest difference is in the buns as White Castle buns are airy and light. It’s not necessarily a bad thing but it just feels as if there’s very little bread in it and is mostly air. Krystal buns on the other hand, are denser and seem to have more weight. Both buns are soft but Krystal buns are superior in terms of texture and taste. So if you want a sweet burger, go with White Castle, but for tangy and savory burgers, it’s Krystal. The other major difference between the two is the bun, as Krystal feels fuller. However, some folks might prefer White Castle because of its juicy sweet taste, and it is also a few cents cheaper. But Krystal scores points for the tanginess and their buns, which makes you feel fuller. Since that’s the only thing that really matters when you’re going out to lunch, those are good reasons to try Krystal. 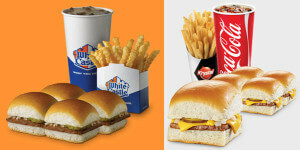 But of course there will be folks who’ll prefer White Castle over Krystal and vice versa. The reason doesn’t just has to do with taste per se but because it’s what they grew up and familiar with. To better understand this battle between North and South cheeseburgers, keep in mind that both restaurants stick to their own territories. To this day White Castle can be found in 11 Northern and Midwestern states while Krystal in a dozen states in the South. There are only two states where you can find both locations, Tennessee and Kentucky. White Castle was founded in 1921 and is known as the oldest fast food burger chain in America. The restaurant is also famous for its sliders, small, square hamburgers. The brains behind the chain was Billy Ingram, a former insurance man, and Walt A. Anderson, a cook. During the early days of White Castle, their burgers cost just 5 cents and remained at that level until the 1940s when prices went up to 10 cents. Anderson is also credited with inventing the hamburger bun, and White Castle gained a reputation for cleanliness that was unequaled during those times. Over at the South you have Krystal, established in 1932 and is the fourth oldest fast food chain in the US. It was founded by J. Glenn Sherrill and Rody Davenport, Jr. in Chattanooga, Tennessee. While the United States was feeling the effects of economic depression, Davenport Jr. believed that a clean restaurant serving quality food will always attract customers, and that proved to be true. From the 1930s onwards, Krystal experienced rapid growth and began offering drive through services in the 1950s. Like White Castle, the chain is known for their square hamburgers and also steamed onions. Part of the success of the company can be attributed to the following fact: Davenport Jr. spent some time visiting White Castle restaurants and took note of what made them successful and applied them to Krystal. 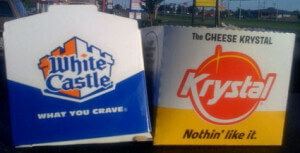 It’s no surprise then, that the battle between Krystal and White Castle continues to this day. While other burger restaurants have sprung up, when it comes to sliders these two are at the top.